– Pastor Curtis Gilbert on how a pastor needs his people as much as they need him. Ministry can be chaotic, said Belleville pastor Curtis Gilbert. In fact, it definitely will be. What pastors are called to is not a calling of ease or of superficial comfort, Gilbert told leaders at the 2017 IBSA Pastors’ Conference, but one that will call everything out of you. Gilbert urged pastors to evaluate their own love for Jesus, for the gospel, for their family, and for God’s people. “Even the sheep that bite you are precious souls,” Gilbert said, adding that pastors can become arrogant and impatient when they stop viewing church members as God’s children, and when they forget that they themselves are every bit as much a sinner as their people. Don’t delegate all the shepherding to other people, Gilbert told pastors. “Be with the sheep; it gives your preaching credibility,” he said, emphasizing that a pastor needs his people as much as they need him. Brad Pittman (center), pastor of Grace Fellowship Church in Davis Junction, accepted this year’s IBSA Bivocational Pastor of the Year award this morning at the Pastors’ Conference in Decatur. The mass shooting at First Baptist Church, Sutherland Springs, Texas, just two days before the conference began lent a heightened urgency to the meeting and the messages. Randy Johnson, pastor of Tabernacle Baptist Church in Decatur, preached on how to share the gospel as if it’s going to be your last opportunity, while Ed Stetzer, executive director of the Billy Graham Center at Wheaton College, told pastors the world they minister in is only getting darker. The Christian worldview decreases a few percentage points every year, said Stetzer, former executive director of LifeWay Research and a long-time analyst of church and religion trends. And it’s probably going to get worse before it gets better, he added. The 2018 IBSA Pastors’ Conference is Nov. 6-7 at First Baptist Church, Maryville. Officers are Bob Stilwell, president; Ben Towell, vice president; and Rayden Hollis, treasurer. Curtis Gilbert (above) warned pastors not to miss four areas of needed assessment evident in Paul’s words. First, how’s your love for Jesus, asked Gilbert, pastor of The Journey in Belleville. Don’t get used to Jesus, he told pastors. “If you’re bored, the reason is you’ve gotten your eyes off him, and onto yourself and onto your ministry,” he said. No matter how long you’ve walked with Jesus, Gilbert told conference attenders, you still have as much need for the gospel and for Jesus as when you first confessed him as Lord. The Metro East pastor asked pastors to assess their lives and ministries in three more areas: how well they love the gospel, their families, and God’s people. Joe Valenti (right) spoke after Gilbert and urged pastors to fall in love with the gospel. “Everything else comes out of that,” said the student and missions pastor from Cuyahoga Valley Church in Broadview Heights, Ohio. I remember a time when I sensed God leading me to go deeper in my preaching, specifically on the topic of racial reconciliation. As I was speaking to the congregation, I felt the level of tension rise almost immediately. This was confirmed by comments I received later. It’s not easy to preach on difficult topics. The cultural issues of our day can be divisive. They can cause conflict in a church. Pastors tend to know where their people stand on the hard topics, and since they do, many would rather stick to abstract application in order to avoid hitting a nerve with consistent volunteers and faithful tithers. No wonder we tend to shy away. But we can’t avoid the issues people in our world are navigating every day. In his seminal work “Christ and Culture,” H. Richard Niebuhr wrestled with how Christians are to relate to contemporary culture. For Niebuhr, the best approach is not to stand against, blend in with, take the best of, or try to sanctify culture. Rather, Christians should aim to transform culture. There is no doubt that Niebuhr was correct in his assessment. Anyone who has understood the Gospels will affirm our Lord’s purpose and desire to change the heart of man, which invariably leads to a change of culture. Preaching is an integral part of the process of cultural change. It is during the preaching moment that people are most in tune to the voice of their shepherd, and it is during that moment where the Spirit of God is at work both in the heart of the preacher and in the hearts of those who are listening. The apostle Paul exemplified this kind of preaching. For him, the gospel removed barriers of race, gender, and religion; it also gave clarity to domestic issues, such as marriage and divorce, as well as matters related to sexual deviance and perversion (Romans 1:18-24; 1 Corinthians 5:1-5, 7:1-16; Galatians 3:28). Since the church still contends with these same issues, preachers must continue to proclaim and apply the same gospel. Some preachers hesitate to deal with cultural issues and difficult subjects because that approach lends itself to topical preaching, and away from a more expository method. However, those of us who preach should understand that some of the most effective preachers in Christian history preached sermons that were not expository in the strictest sense. And even still, one can preach expository sermons while addressing key topics as they arise. Another reason some preachers neglect these issues is a lack of sensitivity. Pastors preach about and congregations prioritize the things that resonate most with them and the areas in which they are most involved. I know a pastor in Laredo, Texas, near the border of Mexico. He spends the majority of his time ministering to illegal immigrants trying to escape the violence perpetrated by drug cartels. Therefore, his view on whether America should build a wall is much different from someone who lives elsewhere in the U.S. The point being, in order to speak to the issues, pastors must gain some level of familiarity with the issues, if not for themselves, for the sake of those they serve. Perhaps the most common reason pastors shy away from difficult topics is that preaching on these issues can cause conflict within the congregation. This, of course, is a pastor’s nightmare, one I faced head-on when I felt the tension begin to rise the Sunday I preached on racial reconciliation. But remember, people usually come around. In our case, after some time had passed and those present had the opportunity to prayerfully consider what was said, their testimonies and changes in behavior demonstrated to me that spiritual growth did occur, enabling several people to move a step closer toward true healing. First, be sure to always revert to overarching principles in Scripture, such as love, justice, reconciliation, grace, and forgiveness. In his book “Principle-Centered Leadership,” Steven Covey argues that leaders do better to maintain focus on principles, rather than values. Values change and may differ between people and organizations, while principles remain constant. The same prescription can be applied to pastoral leadership and preaching. Take for example issues such as abortion, the death penalty, and health care for the elderly. The reality—even in Southern Baptist circles—is that there are differences of opinion when it comes to these issues. However, the overarching principle is the sanctity of human life. Approaching any of those issues from that perspective will remind people that all life is precious in the sight of God—in the womb, the nursing home, and everywhere in between. This is where the preacher is able to deal with the issue while helping people see beyond their personal values, and lead them to submit to a higher theological principle—in this case, God’s value on life. Second, consider the idea attributed to Karl Barth, that sermons are best prepared with the Bible in one hand and the newspaper in the other. Pastors must be aware of the conversations taking place. Understand the arguments. The people you preach to on Sunday are looking for answers to the pressing concerns of the day. They are trying to figure out what position is the right position. Third, after listening well to the issues, do not be afraid to deviate from a 10-week sermon series you’re currently preaching in order to tackle a difficult topic. When the entire world is talking about human trafficking, a terrorist attack, or protests and issues of race, Christians want to know the heart and mind of God on such issues. Some are questioning where God is when tragedy strikes, and if your people are not asking these questions for themselves, it is likely they know someone who is. Imagine the witnessing opportunities members of your church will have when you have equipped them with a sound biblical perspective for the discussion that is sure to take place in the cafeteria at work or at the student union on campus. Finally, use other venues that allow your congregation to hear your voice on crucial matters. In my experience, some of the deepest theological discussions related to culture have taken place during our mid-week gatherings. There are a couple of advantages to using a Sunday evening or Wednesday evening to preach or teach on difficult topics: If the topic is published beforehand, church members who normally do not attend may, and they might even invite a friend who does not attend church at all. And, I have found, difficult topics and current cultural issues often make room for seasons of focused prayer. If evening or mid-week services are not an option, look for another opportunity, like a written article distributed to your congregation. For example, I wrote an article titled “The Ministry of the Peacemaker” based on Matthew 5:9 in response to violence in Africa, the Middle East, and our own city of Chicago. In the article I challenged the congregation to live incarnationally within their own sphere of influence, allowing the peace of God to emanate from their lives as a means to bring about change. A close examination of the words of Jesus in John 17 reminds us that to isolate ourselves from culture was never our Lord’s intent. Our responsibility as pastors is to facilitate disciple-making. One way we do this is by equipping the saints to share their faith and make disciples wherever they go. With the ever-increasing presence and influence of social media, our challenge is a culture that is constantly bombarding those who God has placed in our charge. For their sake, we must be careful not to shy away from difficult topics. Instead, we must speak clearly and authoritatively from the perspective of God’s Word. Bryan Price pastors Love Fellowship Baptist Church in Romeoville, the congregation he started in 2003. This article was originally printed in the Spring 2017 issue of Resource magazine published by IBSA. In his little book, “The Priority of Preaching,” Christopher Ash writes what every pastor has thought at some point. Maybe you are a pastor and you have doubted whether your preaching is really doing anything. Maybe you are a church member who sometimes falls asleep during sermons and you wonder if there is a better way of connecting with today’s postmodern culture. Is preaching a thing of the past? We are far from the Puritan days when one minister apologized to his congregation for preaching a two-hour sermon and they all replied, “For God’s sake sir go on, go on!” During the era of the Baby Boomers, preaching in many churches became a casual talk on how biblical principles can address felt needs, bolstered by the use of multimedia technology. 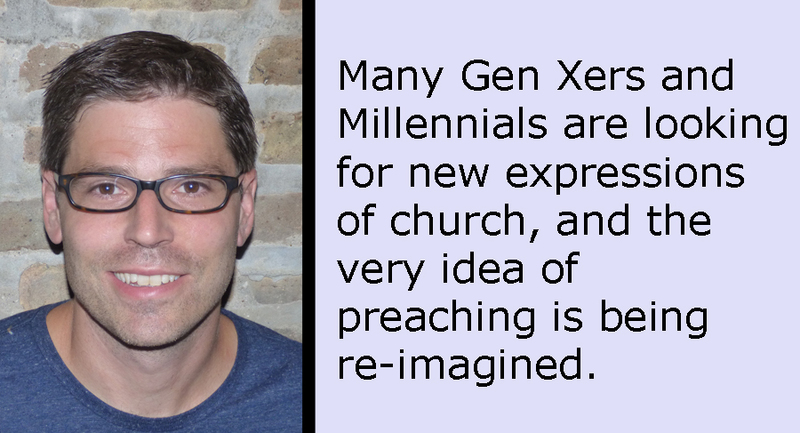 Many Gen Xers and Millennials are now looking for new expressions of church, and the very idea of preaching is being re-imagined. Wouldn’t it be more authentic to have a dialogue about the Bible where everyone could share his or her own experiences and insights? I define preaching as one-directional, verbal proclamation of God’s Word culminating in the gospel. And I still maintain that this is an absolutely essential practice for the church. Why? For one, we see it happening all over the Bible (i.e. Acts 10:33-44). That’s descriptive, not necessarily prescriptive, you might say. Well, it is also expressly commanded elsewhere (i.e. 2 Tim. 4:2). But couldn’t the intent behind “preach the word” be fulfilled in other ways than one person talking at other people for an extended time? I certainly believe there are several different legitimate styles of preaching. But the method of preaching is critical. We need times when we bite our tongues as we are confronted by the authority of God’s Word. In an age of relativism and rebellion against authority, it makes sense why we don’t want to sit under preaching. We don’t want doctors; we’d rather self-diagnose. The idea of a wiki-sermon that we all have a hand in constructing is much more appealing. But our great need is to hear, “Thus saith the Lord,” and let his external word rebuke us, call us to repent, make us ready to receive the message of the gospel, and then respond in faith and obedience. Hearing a declaration of something that has happened, something to which you can’t contribute a thing but must respond to with either belief or disbelief, best comports with the gospel. Since there is a constant need to have the double-edged sword of God’s Word pierce our souls to expose our sinful hearts and then graciously present Christ to us in all his resplendent glory so that we can trust in him as our righteousness and healer, preaching will always be indispensable. There is a place for small group discussions and seminars and life-on-life mentoring. But preaching is an essential element of the life and health of a church. The practice of preaching can be abused (when it becomes a chance to express one’s own ideas instead of expound a text), but that shouldn’t cause us to avoid its proper use. Some preachers are more gifted than others, but the mark of a mature believer is to be easily edified as long as the Word of God is being preached. May he do it again today! Nathan Carter is pastor of Immanuel Baptist Church in Chicago.